The German approach to the current economic situation has always been that the crisis is caused by the “fiscal indiscipline” that permeated certain states who run excessive public debts. This is made manifest in both the way Europeans are reacting to the crisis (since Germany is heavily influencing European decisions) and in the latest demand for a debt ceiling rule to be enshrined in each country’s constitution so as to discipline the “undisciplined”. 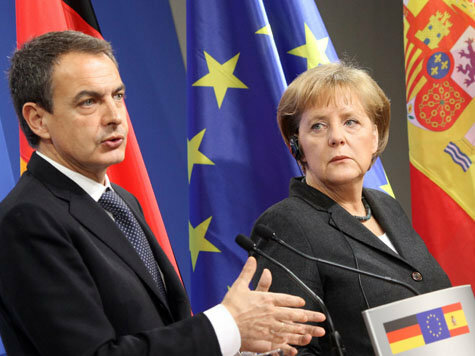 The first state to adopt the German demands for the “golden rule” of budgetary stability is Spain, which within these days is voting on including a debt ceiling in its constitution as EurActiv reported on August 31. It is always good for states to maintain control of their finances. It is always important for politicians to be bound by laws, so as to avoid abuse of power and corruption. Nevertheless, no matter how good this debt ceiling might be, it still is not the solution to the problem, since it first fails to see what the problem is, what its roots are, and second as we saw in the US debt ceiling debate recently, any debt ceiling can be raised provided the circumstances, even if it is written in the constitution. After all we all know how ineffective the Stability and Growth Pact has been. It also issued “ceilings” and “limits” aiming at controlling the “undisciplined”, yet those have been violated time and again, ironically by Germany and France first. Moreover the effectiveness of those constraints in the economy is questionable since so far they have failed to bring convergence in the constituent economies of the euro which would lead to real stability and create real growth. The debt ceiling is not a solution to the problem since it does not address the root of the crisis, which is not public debt (that is only part of the problem). The fiscalization of the crisis story — the insistence, in the teeth of the evidence, that it was about excessive public borrowing — has become an article of faith on both sides of the Atlantic. And that faith has done and will do untold damage.</p> For too long European leaders have been misreading the economy. They have never put forward any plan for real growth, for creating job opportunities (unemployment in Europe is consistently higher than in any other advanced economy). They have always been willing to hide the structural flaws of the euro under the carpet by putting forward the much-vaunted ideology of fiscal discipline. Those are the lack of (i) a wealth recycling mechanism that would productively recycle (with profit) the accumulated surpluses within the euro area in other parts that need investments, in order to achieve balanced growth and convergence, (ii) a unified banking sector that will operate within a single legal framework and be overlooked by a single European authority who will be responsible for both re-capitalizing banks and carrying out objective stress tests (not like the ones that are now carried out by national authorities), (iii) a European treasury with jurisdiction over the euro area that will have the powers that every treasury in the world has, just like in the US. The crisis is systemic. It is a triple crisis comprised of (a) debt crisis in all of the euro area, (b) banking sector crisis, (c) under-investment crisis. “Golden rules”, budget constraints, debt ceilings and other sort of restrictions are good to keep politicians in check , yet those massively fail to understand and therefore address the real issues in the economy and the real cause of the current crisis. So German Chancellor Merkel and anyone else can cling on to the narrow-sighted approach they have and continue the sterile rhetoric that fiscalizes the crisis, by putting the blame on the peripheral countries and their debts. Greece, Ireland, Portugal can certainly be blamed for being the first houses to collapse in this earthquake, yet no one can blame them for causing the earthquake itself and especially in the Euro Area no one can say that, when the ground upon which these houses were built was not stable enough.